Digging up British royalty seems to be the latest fad in archaeology. Having found Richard III, researchers now want to exhume the body of King Harold II to find out whether he really died in the manner portrayed in a famous section of the Bayeux Tapestry—with an arrow shot into his eye. Schoolchildren across the land are taught that the Anglo-Saxon was killed in the Battle of Hastings in 1066 by Norman knights. But amateur historian Peter Burke believes this could all amount to Norman propaganda, and that Harold may have lived on into his 80s. The same team of archaeologists who discovered the remains of King Richard III under a Leicester car park will be using ground-penetrating radar in a bid to locate Harold on Tuesday. They hope to find his remains in the grounds of Waltham Abbey Church in Essex, and to prove the cause of death once and for all. 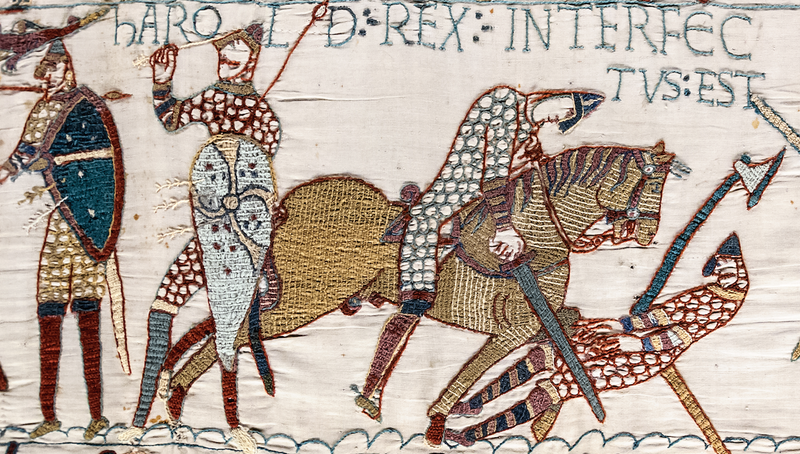 The search, which coincides with the 948th anniversary of the Battle of Hastings, will be filmed for a documentary about the rival theory of Harold's death. If the scan does uncover evidence that the late king is lying there, it may still be some time before permission is granted for a full excavation.